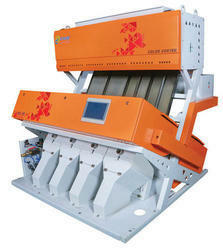 Manufacturer & Exporter of Multi Grain Sorting Machine & Rice Sorting Machine. Our product range also comprises of Color Sorting Machine, Grain Sorting Machines and Coffee Sorting Machines. Now, sorting different commodities wider than 4mm pitch, with defects of specific size is made easy. 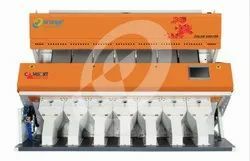 Thanks to the orange’ X sort - Multi Grain Sorter with contour mapping and Quad Level Sorting Technology. Internet connectivity in full duplex. Basmathi Rice, Wheat, Double Boiled, Channa Dhal, Moong Dhal, Fried Gram Now, sorting different commodities, with defects of Specific Size is Made Easy. Thanks to the ORANGE’s Camsort Digital- Multi Grain Sorting Machine with Contour Mapping and Quad Level Sorting Technology. The all new Camsort Digital - Multi Grain Color Sorter is the result of Enthusiasm & Continuous R & D to provide a top of its Class Color Sorter for Food Industry in India and abroad. 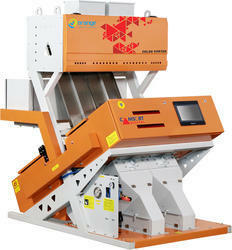 Orange is leading manufacturer of Sorting Machines in India with maximum no of Installation crossing 3700 nos. We are in this business last 16 years and have grown from small 60 channel machine manufacturer to today with machines that can give a throughput of 6 to 8 Tons. Started with Rice today we have machines for various commodities like Pulses, Peanuts, Cashew, Tea, Sesame, Pepper, Plastic etc.. Our Machines are already running for all these commodities very successfully. Sorting different commodities, with defects of specific size is made easy. Thanks to the ORANGE’s CAMSORT DIGITAL - Multi Grain Sorting Machine with Contour Mapping and Quad Level Sorting Technology. The all new CAMSORT DIGITAL - Multi Grain Color Sorter is the result of enthusiasm & continuous R & D to provide a top of its class color sorter for food industry in India and abroad. Now you can demand for more quality output in our Camsort Digital series color sorters. 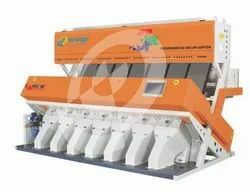 This series machines are the combination of best technology available today and our decade of experience in the color sorting industry to give you the ultimate benefit of getting consistent good purity in sorting with very minimum loss of good grain in the rejection which means more profit to you. With its powerful 4096 pixel dual side camera, 1 millisecond ejector response time and quad level sorting technology, you can get your sorting done at great accuracy and speed. What’s more, this machine is built with embedded computer and can withstand any future inventions that will be made in the sorting algorithm. This machine is designed unique with the powerful software that makes billions of right decisions to identify shape and size of defect, spot defect and watershed algorithm to arrive the area of every product pass through our high tech CCD camera, in a millisecond. Sorting different commodities, with defects of specific size is made easy. Thanks to the ORANGE’s CAMSORT DIGITAL - Multi Grain Sorting Machine with Contour Mapping and Quad Level Sorting Technology. The all new CAMSORT DIGITAL - Multi Grain Color Sorter is the result of enthusiasm & continuous R & D to provide a top of its class color sorter for food industry in India and abroad. 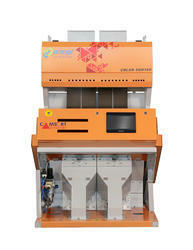 Now you can demand for more quality output in our Camsort Digital series color sorters. This series machines are the combination of best technology available today and our decade of experience in the color sorting industry to give you the ultimate benefit of getting consistent good purity in sorting with very minimum loss of good grain in the rejection which means more profit to you. We are well known Exporter, Manufacturer, Distributor, Supplier, Trading Company of Rice And Gum Sorting Machine in Coimbatore, Tamil Nadu, India.